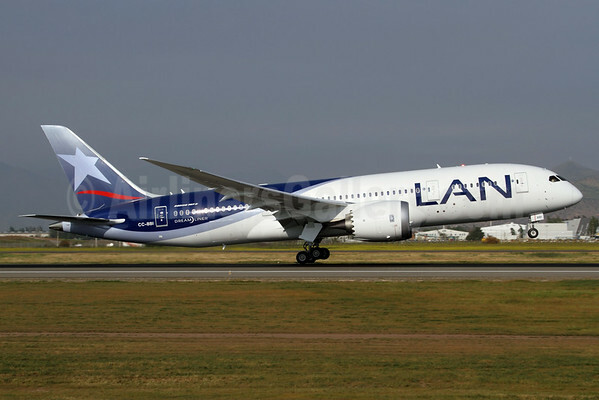 LAN Airlines (Chile) (Santiago) will introduce the Boeing 787 Dreamliner on the Santiago – Sao Paulo (Guarulhos) – Milan (Malpensa) route on March 2, 2016 per Airline Route. Copyright Photo: Michael B. Ing/AirlinersGallery.com. Boeing 787-8 Dreamliner CC-BBI (msn 38480) departs from Los Angeles International Airport. This entry was posted in LAN Airlines (Chile) and tagged 38480, 787, 787-8, 787-8 Dreamliner, Boeing, Boeing 787, Boeing 787-8, Boeing 787-8 Dreamliner, CC-BBI, Guarulhos, LAN Airlines, LAN Airlines (Chile), Malpensa, Milan, Santiago, Sao Paulo on August 3, 2015 by Bruce Drum. 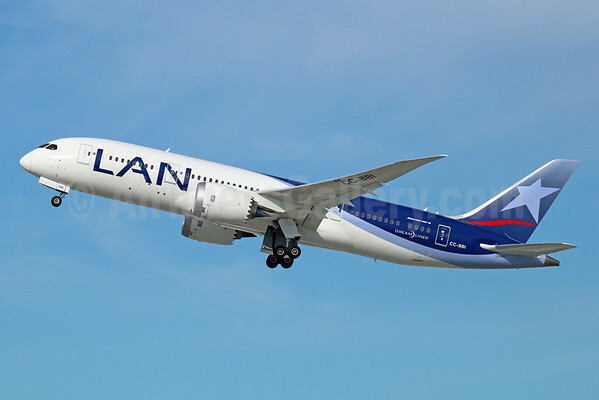 LAN Airlines (Chile) (Santiago) will operate the Boeing 787-8 Dreamliner on the weekly Santiago-Easter Island-Papeete (Tahiti) route starting on September 21 per Airline Route. On the financial side, LATAM Airlines Group reported operating income of $267 million for the fourth quarter 2014 and $513 million for 2014. Net income reached $98.3 million in fourth quarter 2014, compared to a net loss of $46.1 million in fourth quarter of 2013. LATAM reported a net loss of $109.8 million for full year 2014, compared to a net loss of $281.1 million in 2013. These results include foreign exchange losses of $130.2 million in 2014 and $482.2 million in 2013 mainly resulting from the devaluation of the Brazilian real. In addition, this result includes the recognition of a $112 million provision during the first quarter of 2014 related to estimated penalties for anticipated aircraft redeliveries as a result of our fleet restructuring process. Copyright Photo: Alvaro Romero/AirlinersGallery.com. Boeing 787-8 Dreamliner CC-BBI (msn 38480) arrives back at the Santiago base. This entry was posted in LAN Airlines (Chile) and tagged 38480, 787, 787-8, 787-8 Dreamliner, Boeing, Boeing 787, Boeing 787-8, Boeing 787-8 Dreamliner, CC-BBI, Easter Island, LAN Airlines, LAN Airlines (Chile), Papeete, Santiago, SCL, Tahiti on March 20, 2015 by Bruce Drum.